Place the pitted cherries, water and 1 cup of sugar and lemon juice in a large, heavy saucepan over medium heat. Stir frequently, gently crushing the softened cherries with the back of a spoon until the sugar is melted and the cherries become soft and rupture, approximately 10 minutes. Add the buttermilk and half and half and continue cooking over medium heat, stirring until the mixture reaches 180 degrees. Do not allow the mixture to boil. Meanwhile, place the egg yolks, remaining 1/2 cup of sugar and salt in to a large bowl or the bowl of a stand mixer. Mix on medium speed until the egg yolks become light yellow and double in volume, about 3 minutes. Remove the cherries mixture from the burner. Add 1/2 cup of the steaming hot liquid to the bowl with the egg yolks, whisking to combine. Add the egg yolks back in to the cherry mixture in the saucepan and stir to combine. Place back over medium heat, stirring constantly until the mixture thickens and coats the back of a spoon, about 5 minutes. Allow to cool to room temperature, and then refrigerate in a sealed container until chilled. Process in your ice cream maker according to the manufacturers directions. I went to the farmer's market and found the most amazingly succulent Bing Cherries. I was so overcome with their beauty that I was compelled to purchase no less than 8 pounds. While my family is more than happy to eat such beauteous cherries out of hand, I was planning to make gelato and knew that the cherries would shine if incorporated. I thought about adding a supporting cast such as chocolate chunks or vanilla bean to the cherry gelato, but when an ingredient is so pitch perfect, it's almost sacrilegious to make it share the stage. However, I decided that my cherries were so ripe, dark and sweet, that the gentle tang of buttermilk would serve as a nice counterpoint. 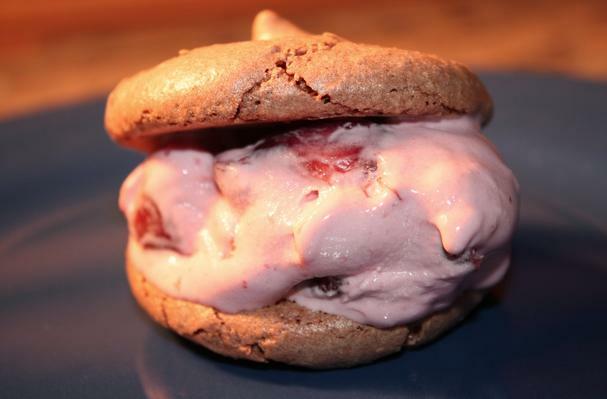 I served the cherry gelato sandwiched between macaron-like almond-chocolate meringues. This idea sprang from the fact that I'm always left with copious amounts of egg whites as a byproduct of gelato making.